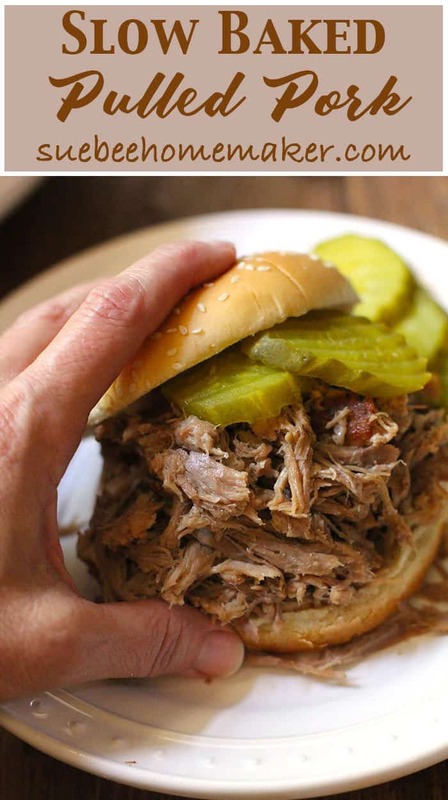 Slow Baked Pulled Pork is the perfect main course for holiday entertaining or as a game day staple. Only 15 minutes of prep and then 12 hours in the oven. Works like clock-work, and you can even make it while you sleep! 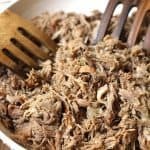 How easy is Slow Baked Pulled Pork? VERY!! 😀 Which makes this recipe a huge win for busy people during the holidays or on game days (when we’d rather be chatting with company/watching the game than cooking)! Make the spice rub – just six ingredients. Rub the spice rub all over the roast, cover it, and let it marinate overnight in the fridge. Two hours before baking, set the roast out to get the chill off. Bake on 210 degrees (yup, 210) for 12 hours. DON’T OPEN THE OVEN during bake time. Remove roast from oven and let it rest for 20 minutes. Discard shoulder blade, skin, and visible fat. Shred the meat, and serve. Easy enough? I say yes. The method and the RUB! I use an old-time roasting pan for baking the roast. If you don’t have one, you could use a dutch oven or even just a deep pan and cover it tightly with foil. The most important thing is to cover it and NOT touch the oven for 12 hours. This slow roast method is a technique that I found on All Recipes by Chef John. I also just posted my brother Dave’s spice rub recipe, which is actually the rub I used in this recipe, except for the quantities. Make a large batch of it to keep on hand for other meats, like baby back ribs, brisket, pork loin, etc. Do you see the shoulder blade on the picture below? It literally just fell away from the meat when I touched it. The meat was so tender that I didn’t need forks to shred it either, except that it was a little bit warm. We’re from Iowa and we love pork! Mike and I grew up in Iowa, so we grew up eating a lot of pork. We love it all. Pork chops, pork loin, pork tenderloin, pork ribs, pork patties (yup, it’s a thing! ), bacon, ham, hot dogs (just at a ball game), and sausage. One more time – you can make this while you SLEEP! I recommend putting it in the oven 13 hours before your event so it is fresh out of the oven. OR, you can bake it in advance and then warm it up in a crockpot (on low). Just add a little extra liquid (chicken broth and/or barbecue sauce) so it doesn’t dry out. 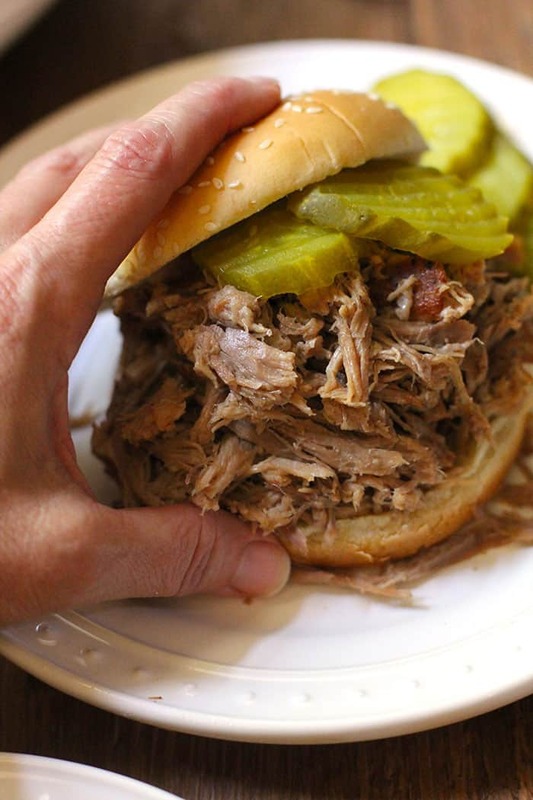 A super slow oven baked pulled pork, with a spicy rub and barbecue sauce! Easy and delish! The day before: Make the dry rub by combining the sugar, salt, pepper, paprika, cayenne, and garlic powder. 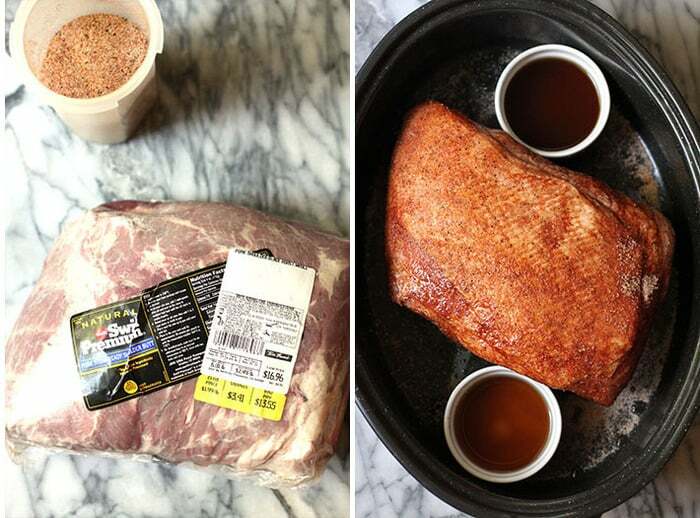 Mix ingredients and coat liberally over the pork shoulder. 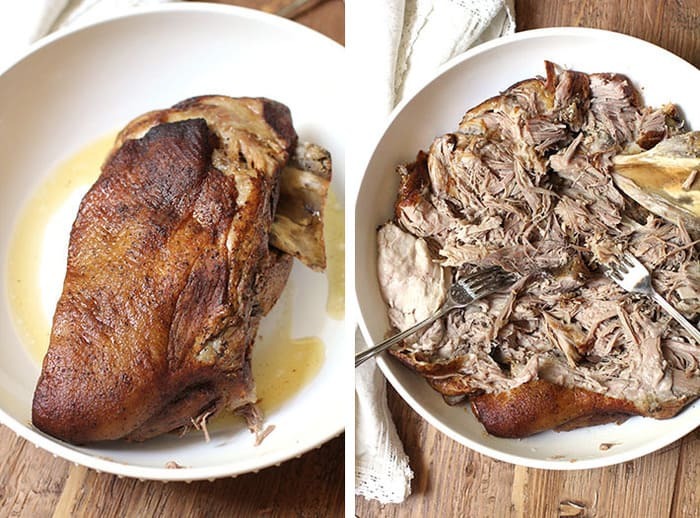 Place pork shoulder in a roasting pan or dutch oven. Let it marinate in the refrigerator overnight, covered. The next day when ready to bake: Preheat oven to 210 degrees. Take two ramekins and combine 1/2 cup water and 1 teaspoon of liquid smoke in each one. Place each ramekin on either side of meat and cover with lid. Roast pork in the oven (covered) for 12 hours, or until very tender. Do not open the oven. After 12 hours, remove and let the roast sit for 20 minutes, or until it is cool enough to touch. Remove skin and visible fat from roast. Remove the shoulder blade and discard. Shred meat with your fingers or do a rough chop with a knife. 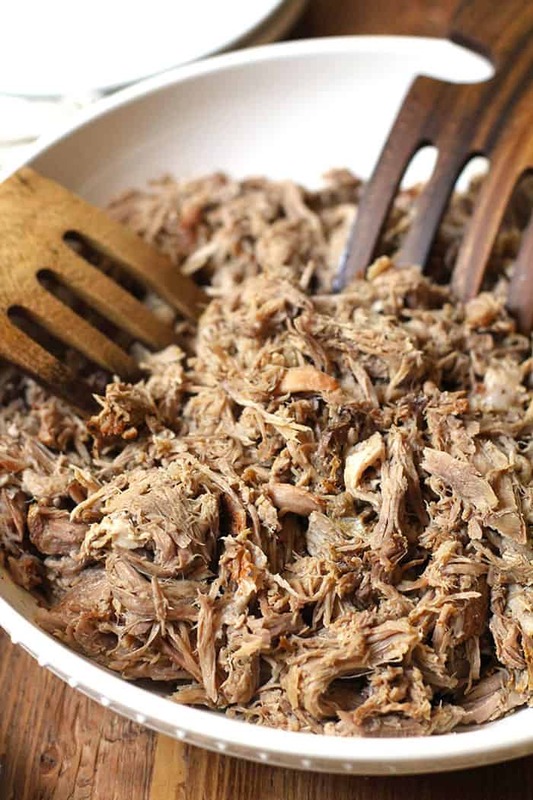 Place shredded meat in a serving dish and drizzle with broth, or barbecue sauce. Serve warm. Leftover pork freezes well in an airtight container or freezer bag. If you don't have a roasting pan, you could use a dutch oven or a simple large throwaway tin (lasagna sized), and cover tightly with foil. Be generous with the seasoning! Do NOT open the oven during the 12 hour cooking time. If planning an event, start the process for about 13 hours prior to event time. This will ensure that the pork is warm. Cooked pork can be frozen, wrapped tightly, for up to three months. HI there – I just made this recipe yesterday and it tasted really good. How can I achieve a good bark with this method? I don’t think you can get much of a good bark with this method because it’s covered the entire time. You would have to experiment with uncovering it, but I haven’t don’t that myself. Good luck! Hi, not sure if liquid smoke is available in Australia, is there anything else I could use? Hi Dot! I think I would just add some Worcestershire Sauce to the pork. Don’t worry about finding a substitute for the liquid smoke. It will still taste great! If my lid for the roaster pan is gone, can I just cover it with foil? Yes, just wrap it tightly in foil. ???? Just wondering if I could cook this in an electric roaster instead of in the oven? You could as long as it’s a super low temperature (210 degrees) and you don’t open the lid. Good luck!